The Cathedral of the Vladimir Icon of the Mother of God and the Church of Alexander Nevskiy were built in the historical part of Pereslavl in the 1740s. 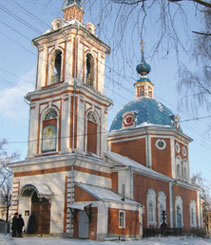 The construction was financed by a citizen of Pereslavl by the name of F. Ugrimov, a merchant and a factory owner. 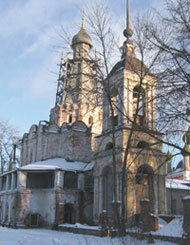 Both temples were a part of the ensemble of the Novodevichiy Monastery of the Purification of the Blessed Virgin Mary. 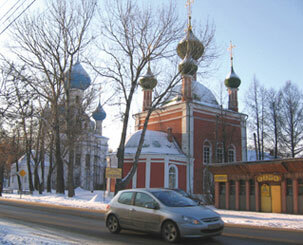 When the Pereslavl eparchy was abolished in the second part of the 18th century, the not-too-wealthy convent was closed and its churches turned into ordinary parish churches. At the beginning of the 20th century the spacious Cathedral of the Vladimir Icon of the Mother of God became the new town cathedral and the ancient Cathedral of the Transfiguration of the Savior was assigned to it. The 18th century belfry which stood between the Vladimirsky Cathedral and the Church of Alexander Nevsky was demolished in 1930 along with the convent’s wall when more lanes were added to the Yaroslavsky highway. Only a small part of the original wall has survived. The churches, situated in the immediate proximity of the Red square, were preserved as parts of an integral architectural ensemble.